President Scott announced that Brian Winslow has submitted a leave of absence request for the summer. Brian is hoping to be back in September. Scott had the club take up a final collection to reach our goal to buy a granite paver in support of the Capital Campaign for the Laconia High School athletic field. Steve Loughlin reported, according to Brian Winslow, the net take, after expenses, from our refreshment booth at Bike Week was a bit over $2,000. Betty Ballantyne reported on her efforts to organize a Roger’s Ride, to be held this year on August 25th. Her goal is to raise between $3,500-$5,000 for Kiwanis. 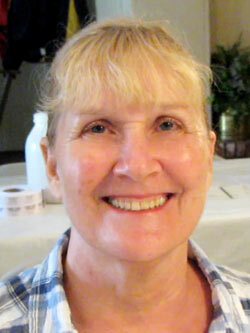 Betty has pro-actively placed Kiwanis members on four separate sub-committees, and called the first organizational meeting for this Wednesday, June 26, 5:15 at the Irwin Ford/Toyota dealership on Bisson Ave. Anyone desiring to help will be most welcome to attend the organizational meeting. located at Irwin Motors on Wednesday June 26th at 5:15 p.m.
Capt. Matt Canfield pulls a ticket while Dana Scott Beane cheerfully audits the pick. 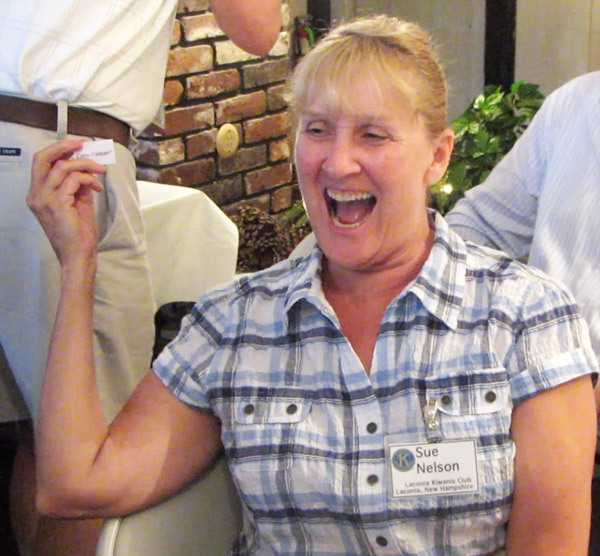 Sue Nelson shows no emotion as she wins the 50 50. For the second meeting in a row, Joe Adrignola was sitting right across from Sue Nelson when she won. The former most frequent 50 50 winner, who has not won a 50 50 since last year, will be soon be released from the cardiac unit at LRGH. He will then be transferred to the Senior Psych ward. $2 from John Walker for two successful deliveries by Laconia in 5 days, which included distributing 4,121 lunches. $2 from Sue Nelson for winning the 50-50. It was noticed, and whispered at the back table that this time, that for the first time in recorded history, she DID NOT donate any money for being married to Don. $2 from Jack Batchelder, 1 for a successful RVYSEF golf scramble this past weekend, and 1 to celebrate daughter Samantha’s decision to attend college on scholarship to Cottey College in Missouri, located about 2 hours south of Kansas City. Jack is a very proud dad. Betty Ballantyne introduced our guest speaker, Captain Matt Canfield, who has been with the Laconia Police Department since 1997. Matt is in charge of the Operations Division. 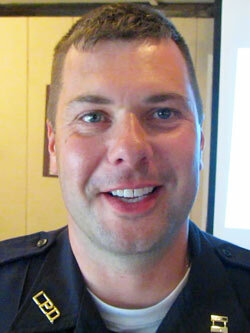 Captain Matt Canfield presented a power point and video titled “Run. Hide. Fight. Surviving an Active Shooter Event.”. Prior to Columbine, police tactics, following or during a shooting, was to secure the area in the vicinity of the shooting and begin negotiations with the shooters. Utilizing this tactic resulted in the Columbine killers having 8 hours inside the school to kill. The new tactics were developed in cooperation with the Department of Homeland Security, and a new program has been implemented nationwide. In a nutshell, the public aspect of the program is labeled Run>Hide>Fight. The first “active shooter” incident was at the University of Texas in 1966. Many other similar incidents have occurred since. The difference in the shooter when an active shooter, is that the they expect to die and the goal is to take as many people out before they are killed or commit suicide. This realization is what generated the national change in approach. ALL active shooters have been killed or committed suicide. There has been one significant success story regarding an active shooter, in Portland, OR. The key there was a current Emergency Action Plan, and the mall employees had practiced it. The basic tenets of Run>Hide>Fight are just what you might imagine by the label. If an active shooter is in an area where you happen to be, run to escape. Leave everything behind, and focus on escape. If escape is not possible, hide, lock yourself in an area where there is possibly a barrier between you and flying bullets, lock and barricade any doors, turn out the lights, silence your cell phone, remain quiet. If neither of these is possible, develop a plan hopefully with fellow employees or people near you to strategize a fight if the shooter enters your area. Most people killed in active shooter incidents did none of the above, but froze. 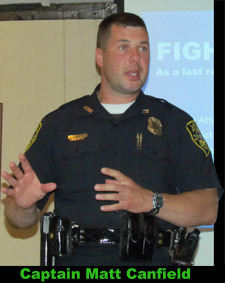 Captain Canfield reported that all 40 LPD officers are trained in the new police approach. All get annual refresher training. Their new tactic is to stop the shooter. First responders will not be there initially to help the wounded, but to stop the shooter. He also said his department is available to assist local businesses in developing an Emergency Action Plan and will come to present the program to anyone. If you were not present for the Run>Hide>Fight presentation or if you would like to see the video again, “click” here. 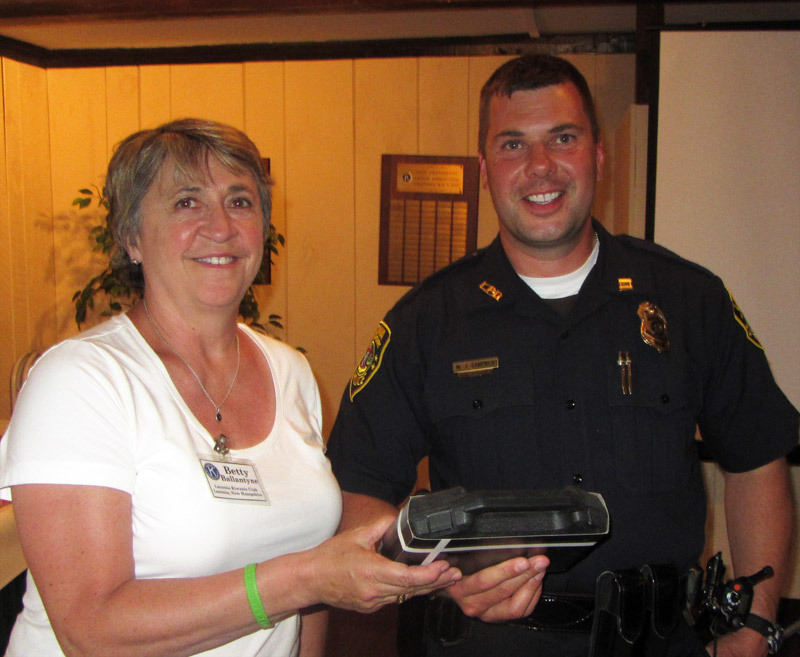 Program coordinator Betty Ballantyne thanks Captain Matt Canfield for his presentation.